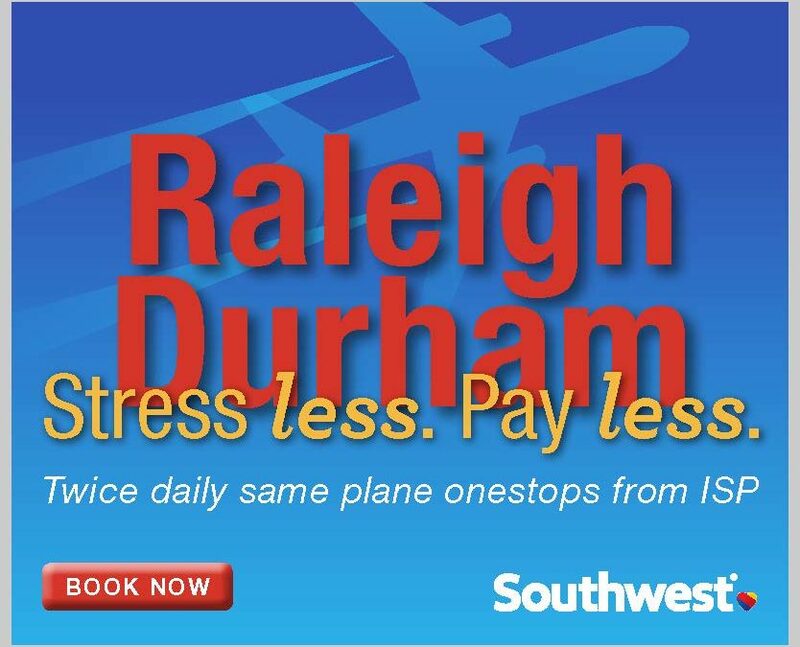 Southwest Airlines now offers twice-daily, same-plane flights between Long Island MacArthur Airport (ISP) and Raleigh-Durham International Airport (RDU), providing an excellent service upgrade for Long Island air travelers. Flight 1656 ISP-RDU: 6:15am – 9:40am. Flight 1022 ISP-RDU: 5:45pm – 9:05pm. Flight 1518 RDU-ISP: 8:45am – 11:55am. Flight 598 RDU-ISP: 9:00pm – 11:55pm. These itineraries are one-stop, same-plane, through Baltimore/Washington International Thurgood Marshall Airport (BWI). Southwest offers additional connecting service to RDU through other cities within its network. Local business leaders, and Southwest Airlines representatives will join airport and local leaders to celebrate the new flights in the MacArthur Airport Southwest Concourse A, March 8th. 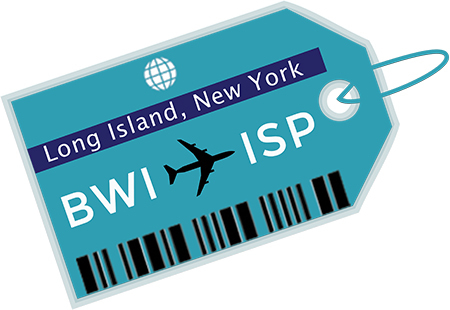 “Raleigh-Durham is one of ISP’s largest markets, and these new flights will provide customers and local businesses with the added convenience they’ve been asking for,” said Angie Carpenter, Town of Islip Supervisor. “Just like Long Island, Raleigh-Durham is a center for innovative companies, universities, and economic activity. The synergy between the two cities will provide further economic growth for our community,” she said. “We are excited to share Southwest’s legendary hospitality and growing service with our Long Island Customers. We’ve been flying from MacArthur Airport for almost 20 years, and today’s service further enables us to connect people to what’s important in their lives,” explained Raphael Weiner, Senior Business Consultant – Network Planning for Southwest Airlines. “Southwest is eager to pair our world renowned service and customer-friendly policies with expanded options to customers traveling to RDU and beyond, as well as enabling more travelers to reach Long Island,” Weiner added. “From healthcare to technology, to banking and retail, Long Island means business. MacArthur Airport boosts the economic vitality of our community, and we are delighted that traveling to and from Raleigh will be easier for our customers,” explained Airport Commissioner, Shelley LaRose-Arken. The Commissioner pointed to the local science, energy, and technology institution, Brookhaven National Laboratory, as an example of potential strong ISP/RDU business connections. “Brookhaven Labs, is one of the many companies on Long Island that already flies to, and regularly conducts business in, Raleigh-Durham. These added flights will expedite that process, and strengthen ISP/RDU business connections for many others,” LaRose-Arken added. Kevin Law, Long Island Association President and CEO, agreed. “Southwest Airlines’ new flights from ISP to RDU is another step forward in realizing the full potential of Long Island MacArthur Airport, and thus I commend Supervisor Carpenter and the airline for a partnership that will be beneficial to the entire region. MacArthur Airport is a jobs generator and an important resource to us.” Law added. “In addition to business travel, Raleigh-Durham is becoming a tourist destination in its own right, and we plan to also promote Long Island as a destination for customers in the Raleigh area. We expect to see a strong mix of both business and leisure travelers on these Southwest flights, and are delighted by the many opportunities the new service will provide,” added La-Rose Arken. Long Island MacArthur Airport customers enjoy flights on three major US domestic air carriers: American Airlines, Frontier Airlines and Southwest Airlines. Together these carriers currently provide service to fifteen cities nonstop, and connect to hundreds of destinations worldwide. The airport serves 1.3M passengers annually and employs 6000 people, with a $16.1M annual operating budget and an economic impact of $600M to the region and local economy.